This is quite possibly the coolest thing I have seen in a long time. My husband and I are completely Katamari Damacy obsessed. The video game is totally addicting down to the catchy music. The object of the game is to roll up as many items as you can with your Katamari ball. Anyone can play it and there is no shooting or violence. 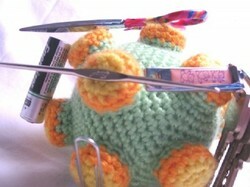 I’ve seen other knitted Katamari balls and even Katamari cakes. This has them all beat. This Katamari comes complete with magnets so you can actually roll things up. How cool is that? Amysbabies sells these on Etsy.